In a world where many of us rely on platforms like Facebook, Google and YouTube on a daily basis, it can be hard for us to imagine life without them. In China, however, a country once known for its cheap knock-offs and imitation products, this is reality. The economic and social changes that arose after the Mao era led to a huge proportion of the country’s younger generation becoming disenfranchised with the political elite, and worried about what the future may hold for them. Questions about the legitimacy of the ruling party, rumoured corruption amongst high ranking bureaucrats and unrest surrounding the reforms introduced by the communist party led to a social uprising, immortalized by the image of an unknown protestor standing defiantly in front of a column of tanks. Borne out of these troubling times, however, grew a burgeoning economy, strong infrastructure and investment in technological and scientific research that has, behind closed doors, established China as a global superpower. It has allowed the country to forge its own path in terms of technology, a path that appears to be absent of the platforms we’ve come to take for granted, such as Google, Twitter and eBay. But it’s not completely absent of them. Instead, China is taking a technological path that looks very similar, but is built very differently. Chinese government attempted to shield its citizens from the western world, there was no hiding the emergence and increasing importance of platforms such as WhatsApp, PayPal and Uber, amongst many others. The other problem is that in the western world we have laws and regulations around privacy and data protection that simply don’t exist in communist-led China. Platforms developed in the western world just wouldn’t work in China, as the government would be largely unable to monitor everything. The solution? Create ‘copycat apps’ that are incredibly similar to their western counterparts but approved and monitored by the Chinese government. For Google, there’s Baidu. For YouTube, Youku. For Twitter, Sina Weibo. And the list goes on. Huge swathes of the internet as we know it have been blocked by ‘The Great Firewall’, but an ever-growing number of imitation websites have emerged that enable the Chinese Government to control citizens’ access to the internet. As these copycat apps began to emerge, app developers from Sydney to Stockholm dismissed them as imitations, or state-run ‘puppet apps’ that let the Chinese government keep tabs on its denizens. The path that these apps took, however, started to turn heads amongst the Silicon Valley hierarchy. 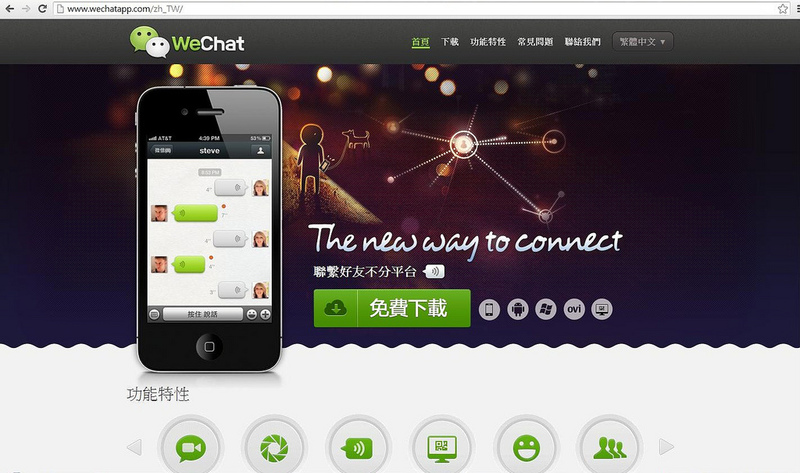 The once derided Chinese apps were being seen as a glimpse of the future. They were starting to shed the moniker of ‘copycat app’. But most importantly, one of them was becoming the world’s first ‘Super-App’. WeChat, or Weixin in Mandarin, is quickly becoming one of the most popular multi-purpose platforms, not just in China, but the world. Released in 2011 by Chinese internet giant Tencent, With nearly 800 million active monthly users, its user base has grown consistently in every single quarter to date. Put into perspective, the population of China, at the time of writing, is 1.38 billion. That’s 60 active monthly users for every 100 people. Compared to its most notable rival, WhatsApp, the market penetration of WeChat is incredible – the app currently boasts average market usage figures of around 64% compared to WhatsApp’s 34% market penetration worldwide. But to those of us more familiar with its western counterparts, it’s not the figures surrounding WeChat’s usage that are interesting. It’s the actual embodiment of the app. It’s safe to say that the most ardent of technophiles will probably have at least 100 apps on their smartphone. Off the bat, WeChat lets users do everything you’d expect it to – instant messaging, sharing life events and chatting to family members. But its feature list extends far beyond custom emojis and profile pictures. 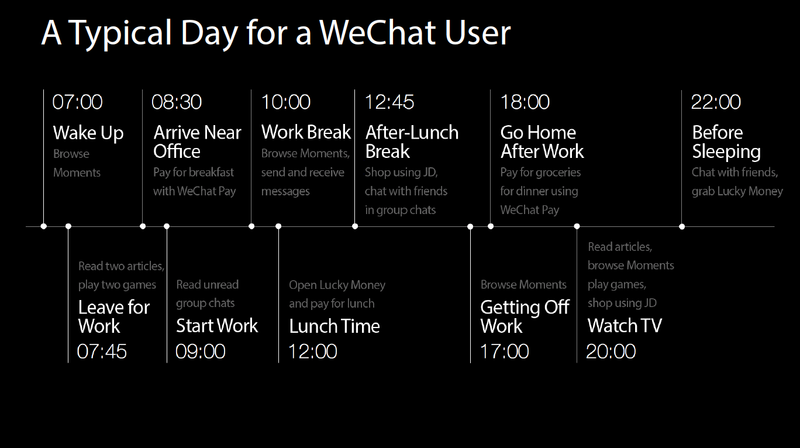 WeChat allows you to arrange a catch-up with a friend, pre-order food from a restaurant, book a taxi to the restaurant, get directions on foot, pay for the meal (or send your friend the money), check movie times and book tickets, and also buy that coat that you’ve been after for ages that has just been put on sale. All without hitting the home button. On the surface, this sounds amazing, at least for the user. Not only does being able to use one platform to complete various different tasks throughout the day save time, it also makes using your phone that little bit easier and provides a solution to the inevitable ‘curse of the forgotten password’. But whilst the main benefit may appear to be the ease of use for the user, WeChat is actually one of the world’s most comprehensive and intelligent data-gathering tools. And yep, you’ve guessed it – this is a marketer’s dream. The possibilities for brand-to-consumer engagement on WeChat are almost unparalleled anywhere else in the world, and this is almost entirely due to the way the app manifests itself in as many aspects of daily life as possible. By knowing a person’s current location and when they usually have dinner, all in one app, fast-food brands can hyper-accurately target consumers when they’re most inclined to purchase. And by tapping into the app’s data on payments and money transfers, marketers can get a good idea of when, where, how and why users spend their money, before using this to hyper-accurately target their audience when they’re most likely to buy. Whilst this would be an issue for many privacy-conscious consumers, another aspect of the app might provide more cause for concern. Whereas WhatsApp maintains a relatively strong stance on free speech (if you don’t mind its owners, Facebook, using your chat logs to target its advertising), WeChat, under the jurisdiction of the Chinese government, goes a step further. Yet despite these concerns, what shouldn’t be overlooked is the technological power that has made a super-app such as WeChat possible. Imagine it in the hands of a western audience and the future looks very exciting indeed.